I try to get my PhD work done as quickly, or rather as efficiently, as possible. I’d much rather be having a pint than reading Deleuze. So I put effort in at the front end of my writing process, while I was beginning to put together my literature review, to create a speedy and reliable work flow. I use 3 excellent pieces of software to minimize the amount of time I spend re-reading books, hunting for forgotten citations, and hunched over a computer screen. Here are the highlights of my techniques that you are welcome to steal for your own purposes. I use a Mac, but this software all works well on PCs too. It’s Friday around 11am (ok, 1:30pm). You’ve made it to the library and sat down in front of a stack of 11 books on critical theory and you have a pub crawl in 5 hours. How are you going to slam through those books while still retaining enough information to write 3,000 words in your lit review next month? Evernote on your smartphone will be your magic wand, Hermione. Alohomora. You can be haphazard like me, or be more careful to capture only the words. I find it doesn’t matter. Evernote’s OCR (optical character recognition) turns the picture into a searchable document with pretty amazing accuracy. 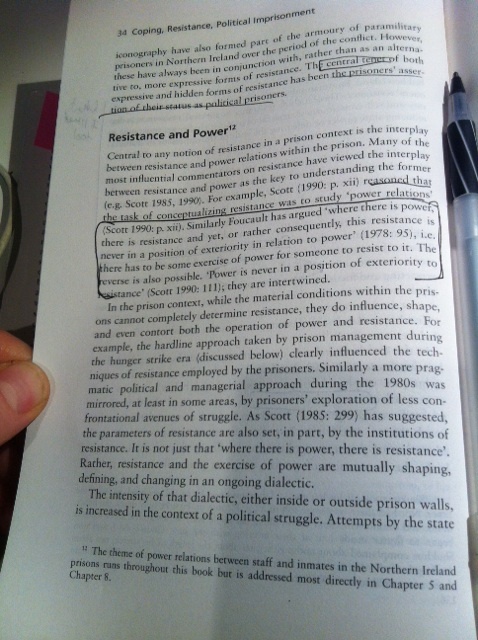 Run a search for ‘Foucault’ in Evernote later and the software will pull up every instance in every page you save (warning: don’t do that search if, like me, you study prison). You can use this technique to capture paragraphs, pages, or entire chapters, if that doesn’t violate anyone’s copyright. Make sure you capture the page number in the image or note it somewhere, or you will be SOL later trying to figure out where it’s from. Pro tip: running a quote through Google will get you the page number and publication about 65% of the time if you’ve lost the citation. The benefit of taking a picture of the page, instead of typing – or worse, handwriting! – relevant quotes is that you’ll find other things on the page that you didn’t notice the first time. Annotating the book directly will make your life so much easier when you’re going back later to see what passage you were saving, but writing in library books is completely immoral. Evernote is much more capable than my distractable mind mind. 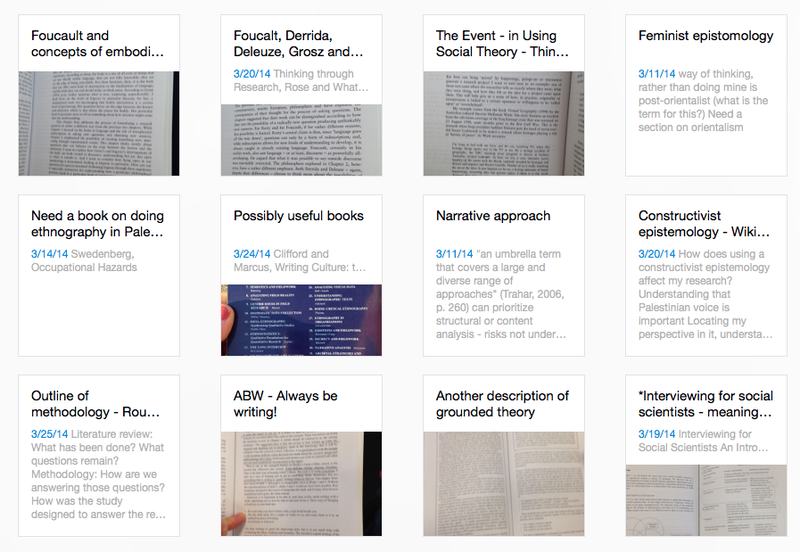 I can save everything in EN: writing ideas, notes from presentations, PDFs, bookmarks, videos and audio recordings. It’s essentially a messy digital filing cabinet. The EN Webclipper for Safari and Chrome (does anyone still use Firefox?) is indispensable for saving anything on the Internet. Pro tip: I like to use notebooks to remind myself of what I need to go back and go through – ‘Add to written bits’ for example are things I want to add into my draft that I’ll forget about otherwise. ‘Possibly useful books’ is that note you’ll never open again but need to make to quell your anxious packrat mind. So now you have 887 photos of book pages – hopefully you’ve been organizing your data with Evernote tags. You can keep your notes in topic notebooks, but the beauty of EN is that you can tag them much more comprehensively. Once you’ve taken your photo or clipped the piece of data you want, title it with a summary and then tag it with every related topic you could possibly imagine. Some people think that organized tags are where it’s at, but I find that it doesn’t hurt to have too many tags – you can always delete them later, or ignore less useful tags. You can either title and tag notes right when you create them, do the whole batch at the end of the day, or push it out a few weeks if you’re a champion procrastinator (not recommended). I find titling and tagging difficult on the phone because of the interface, so if I’m doing a big batch I’ll wait til I’m on a computer – don’t wait too long, your short-term memory cache will soon be filled with less important data. So you’re got all these photos of book pages, hopefully with the page numbers included. How do you know what each photo is from? I tag each book source with the in-line citation, in parentheses. So, for example, (Bernstein 2015) would be everything from this blog entry. That means I can also tag things as ‘Foucault’ without parentheses and know that ‘(Foucault 1977)’ is a quote from Discipline and Punish, and Foucault without any numbers is everything Foucauldian. This means that all my citations are countable (good for seeing where you need more or have too much), easily located, and can be mixed up or browsed when you’re low on ideas. But hold on. Who is (Bernstein 2015)? You’re reading 11 books a day, you don’t remember, and you sure aren’t taking time to put in all the bibliographic details from them into your citation manager by hand. Stop putting all that data into your citation manager by hand: Zotero and Web Browser Plug-In, free! There are lots of citation-management options but I chose Zotero because it’s free and I love the web integration. Since installing Zotero on my desktop, I rarely type in bibliographic data anymore – instead I’ll cull it from my library’s website or Google Scholar in one click using the the Zotero browser extension. That way, when my writing is all done, I can just make a list of the sources I used, create a folder in Zotero, and export a bibliography. Pro tip: Zotero isn’t perfect, especially since GScholar lists lots of sources incompletely or incorrectly. Check regularly that your citations are accurate–if a last name isn’t included that citation is gone forever. So now you’ve got a ton of quotes, a required word count, and a first-year outline. STOP. Don’t open Microsoft Word. MSWord is possibly the worst program developed for a Mac ever, even worse than the new iTunes. It crashes, it takes 15 years to load, and its toolbars take up all the room on the screen. 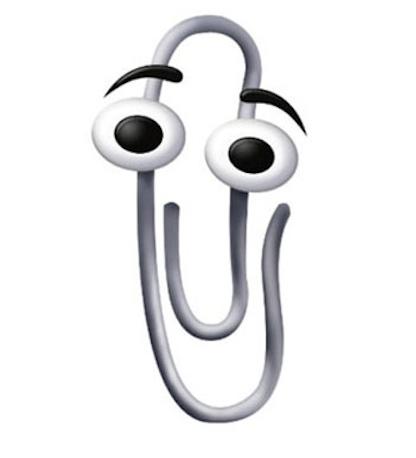 It doesn’t even have Clippy anymore. Ah, Scrivener – it’s full of more features than you’re ever going to need, it’s stable as a rock, and it’s only $45 for a lifetime license. I set all my Scrivener files to automatically save to Dropbox (use Dropbox, or another cloud backup!) literally every 2 seconds. When I spilled Coke all over my computer 2/3 of the way into my first chapter I was able to take some deep breaths, install Scrivener on a friend’s machine, and continue an hour later from literally the exact half-typed word from which I’d stopped. Scrivener is also the best way to transcribe interviews, but that’s not our topic right now. Then once the draft is written, export a bibliography from Zotero and add it in Scrivener. Only after that, export it to Word, do a final edit for formatting and clarity, triple-check your Zotero bibliography, and send it to your supervisor so she can cross all of it out. You’re going to be spending 4-8 hours a day at least one day per week (don’t exaggerate) sitting at your computer writing. Don’t make your back problem worse. Invest in an external keyboard and mouse and put your laptop up on a stack of books or some shelves so that you can sit straight up and work. I also take my laptop over to a bookcase or counter to work standing up. Taking pictures of your screen, or screencapping, will also be really helpful for you– especially when working with electronic documents that don’t let you copy and paste, or when sending funny pictures to your friends. Change your screen cap shortcuts in Preferences to something you’ll remember and use. That’s the a basic summary of how I write fast enough to get to the pub crawl, I mean evening lecture. It’s all for $90, or less than 1 day at a conference. What tricks have you picked up along the way? Thank you for these tips! I can’t think of how many times I’ve wished it was possible to use control+find in a book, so Evernote sounds like the perfect tool for me! You, madam, have an excellent attitude to your PhD (in my humble opinion ;)). Loved this! Has anyone used both Evernote and One Note? I use One Note, and it sounds like it does the same stuff, but Evernote seems to sync with more other programs. Also it would make my supervisor so happy if I gave away the nasty Microsoft One Note (right Inger?). I also think Zotero sounds like it has now surpassed Mendeley for interfacing with other softwares and websites – can anyone speak to that? I’m still in my first year so I guess better to make decisions about software earlier rather than later, right? – Firstly, OneNote provides a lot more formatting options for your notes, notes are basically a stripped down versions of a Word document. – The basic version of OneNote is currently free on all platforms and it uses OneDrive for storage (which is quite large), meaning that you don’t have to pay for anything unless you run out of space. Also, most major universities have Office subscriptions that include the full version of OneNote. – Although both applications use tags, Evernote’s organisation model is based on them 100%, letting you add as many tags as you like and do all kinds of filtering with them. OneNote on the other hand also lets you create custom tags but the way it’s designed at the moment is more focused towards the use case of a small number of universal tags. (Also, a big problem for me: OneNote does not sync tags between devices). – Finally, OneNote is far more integrated with other Microsoft products so if you’re using i.e. Outlook like me it would be of great help. On the other hand, Evernote is cloud-based so it has more integration options with other online/cloud services. All in all, I don’t think the differences between the two are so major that they would swing me either way, it’s just a matter of investing in one of the two and getting it into your workflow. At the moment I would really like to try Evernote but I’m so used to OneNote that it would take a lot of effort to get into a new workflow. I use both Microsoft One Note & Evernote. At the same time? What are the major differences, for you? Microsoft OneNote: I like to use this for note taking for my courses and professional use. Microsoft OneNote is gives me a professional vibe and is more of a structured digital notebook for me. Plus I like that Microsoft One Note has many tabs that are color coded keeps me very organized. Evernote: I like to use this to take general everyday notes, draft blog posts, keep to-do lists and keep track of any ideas have. Evernote to me is more of an extension of my daily planner.Plus Evernote has a simple layout that is great when you are writing. this post is great! i have downloaded and started to teach myself Evernote this morning. is anyone able to give a more detailed breakdown of the steps used to capture images from hardcopy books and annotate/highlight these and export the data as a PDF file to use in scrivener? Awesome! Thanks for this post. 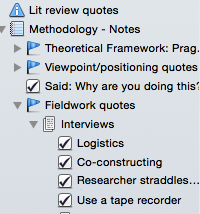 I have been using scrivener to arrange my brain (and phd) for a while but the integration with zotero and Evernote is really good advice. 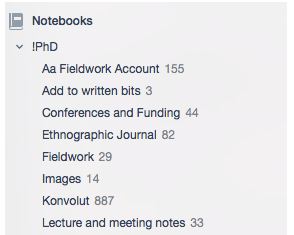 thankyou thankyou thankyou for walking through your practice with evernote…..i’ve had it on my laptop as an image archive for ages but only just now twigged i could do the same with reading notes – super! did i write a blog post in my sleep? this is almost exactly my own workflow with a few tweaks. It works for me! As a first year just learning Scrivener and feeling ambivalent about EN: thank you, thank you, thank you, and a hundred times more. Fantastic post – thanks so much! Evernote also saves emails with one click (from Outlook), which allows you to tag them and get them out of your inbox. I keep an Evernote notebook of literature to get, and save emailed journal tables of contents with relevant articles directly into it. Thank you for an excellent post, I’ve been using Evernote. This sounds like heaven. Off to get evernote now. I kind of use scrivener also and really like it.